Ryan and I are going to Osoyoos next week so we’ve been trying to keep it pretty healthy around here because I know I’ll be spending the next two weeks in a bikini drink copious amounts of wine! Sometimes it feels like all we ever eat is chicken breast so I’m always looking for ways to change it up. 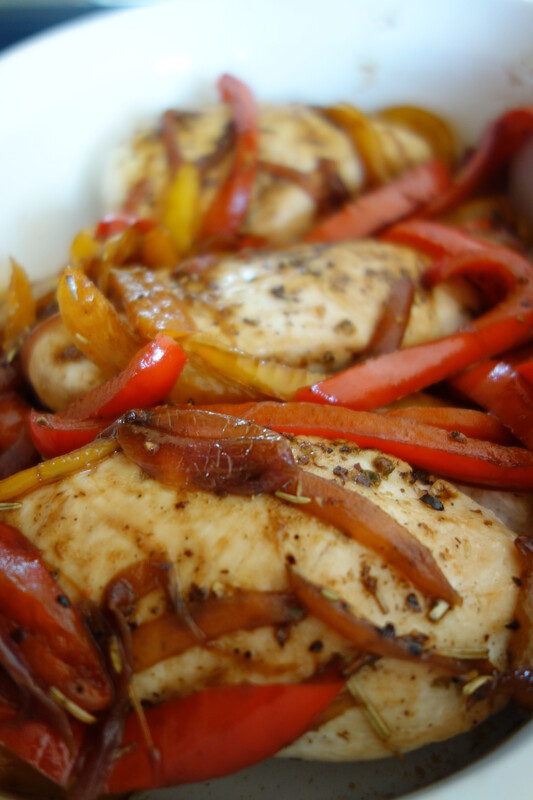 That brought me to this bell pepper chicken recipe that was a big hit! Preheat oven to 450. Rub the chicken breast with mix of salt, pepper, oregano and garlic powder. Warm 2 TSP olive oil over medium hot skillet, brown chicken (about 2 minutes a side) and place in to foil lined baking dish. Bake at 450 for about 12 to 13 minutes. Meanwhile, heat remaining 1.5 tbsp oil in same skillet add the pepper and onion and sauté until tender but crisp. Once they have gotten tender add the chicken broth to the pan and stir everything together well, bring to a boil and boil for about 6 minutes until the broth is almost all evaporated. I also added the dried rosemary at this time. Then stir in vinegar and season with salt and pepper again. Serve over chicken. I served them with white wine and crinkle cut yams fries. Once you have cut your yams into fry size, lay them flat on a cookie sheet, drizzle with olive oil and salt and pepper, bake at 450 for about 10 minutes, flip them and bake for another 10 to 12 minutes. Ryan ate the leftover chicken a couple days later with some shredded jack cheese melted on it and thought it was delicious!